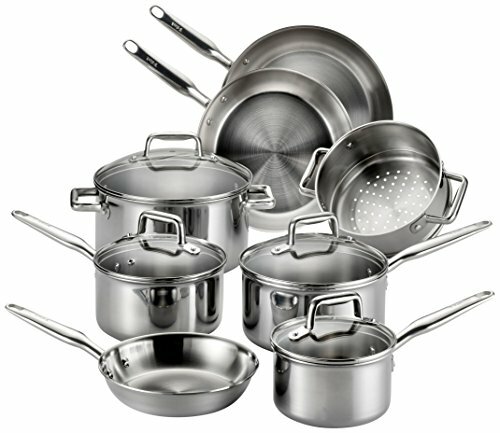 long-lasting stainless steel cookware sets. Stainless steel cookware is a healthy option for cooking when it comes to food safety, being free from the impurities and toxins that nonstick pans are known for. Stainless steel also lasts years when properly cleaned and maintained, and provides the high-quality heat distribution that good cooks demand. With new and emerging technology both regarding cookware and stoves themselves, it’s important to ensure the cookware you use is compatible with your stove. The Heim Concept 12-Piece set is suitable for all stove types, including those with gas and induction heating. The mirror-polish on the stainless steel in the Heim Concept 12-piece set adds a nice, sophisticated touch that blends in beautifully with any kitchen design. Stainless steel is well-known for its imperviousness to rust and forms of corrosion and discoloration. It’s also known for being extremely durable and long-lasting. Riveted handles add an extra touch of durability the 12-piece Heim Concept cookware set, ensuring the handles last as long as the pans themselves. The capsulated bottom is a simple but intelligent design choice; it works to improve heat distribution, meaning your food cooks more evenly, improving not only its flavor, but also preventing any cool spots that might cause you to accidentally undercook food. The 12-piece Heim Concept cookware set comes with all of the cookware essentials to get a kitchen up and running, including: 1.75-quart sauce pan, a 10-inch frying pan, along with 1.75-quart, 2.25-quart, 3.25-quart and 5.75-quart casseroles. All of these come with their own lids, rounding out the set. It’d be nice if the set featured more pans and less casseroles, though this isn’t a huge deal and likely a huge selling point for those looking for quality casseroles at a bargain. Some have found the handles get quite hot; this isn’t a design flaw, however, since these handles aren’t labeled as being cool-touch. In general, you should always use heat protection when touching a handle that isn’t explicitly sold as being cool-touch. Calphalon’s Classic Stainless Steel Cookware Set features sturdy riveted handles with an ergonomic design. Additionally, they stay cool when the pan is hot, so you don’t have to cook with a pot holder in your hand. 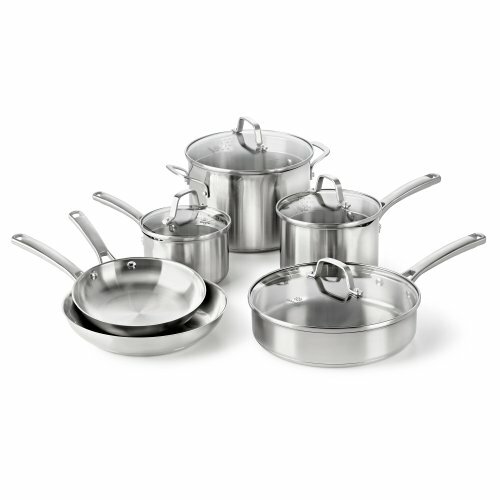 All of the cookware in the Calphalon Stainless Steel 10-piece set come with impact-bonded aluminum bases. The benefit of this is a more even heat distribution, which means better food quality and less chance of accidentally undercooking anything. The cookware set’s internal fill lines make measure a breeze. No more fiddling with different measuring cups. Simply look instead and fill the pans up to your desired amount. In addition to the smart built-in fill line, Calphalon has included another intelligent feature into their cookware design: straining holes built into the lids. This means no more digging around for a colander; simply pop the lid on and strain. The entire Calphalon Classic Stainless Steel Cookware Set is dishwasher safe, so cleaning up after cooking is as simple as loading your dishwasher. While the set is very comprehensive, it’d be nice if the frying pans came with lids like the rest of the included cookware. This isn’t a huge deal, but it’d be a nice touch. Because of the extra heat distribution, you may need to use a different heat setting than you’ve used on different cookware in the past. This isn’t a defect and once you get a feel for how the heat distribution works, choosing your cooking level (for instance, knowing when to use medium instead of medium high) is a lot easier. The big standout feature on the T-Fal stainless steel cookware set is easily its three-ply construction. The interior of the and the exterior of the cookware are both made of stainless steel construction for durability and great culinary results. What’s different about T-Fal’s stainless steel cookware is that it contains an aluminum core. This adds not only an extra layer of durability, but increased performance when it comes to heating. Additionally, the stainless steel interior layer is resistant to sticking; sticking is a common issue those new to stainless steel cookware often face, so this is a good, beginner-friendly feature. The handles are riveted to the pans and are themselves made out of stainless steel for increased durability and performance. The handles are also heat-resistant, so you’re less likely to accidentally burn yourself while cooking. T-Fal’s 12-piece stainless steel cookware set is not only suitable for gas and electric stovetops, but ceramic glass and induction cooktops as well—a key feature, since not every type of stainless steel cookware can handle induction stoves. Additionally, this set is also oven safe. With features like being having an interior surface resistant to sticking, and handles that are heat-resistant, T-Fal’s set also comes with other ease of use features, like clear glass lids so you can see your meal’s progress as it cooks, and flared, anti-drip rims for easy pouring. As anyone who has used stainless steel cookware before knows, keeping it clean can often be a challenge. What’s more is the fact that keeping stainless steel cookware clean is a big part of keeping it in good working condition, so cleaning is a crucial part of stainless steel cookware ownership. Luckily, the T-Fal 12-piece set is dishwasher safe. Additionally, T-Fal also offers handy tips for prolonging the beauty of your stainless steel cookware, such as preheating and knowing when to add salt to prevent pitting. Like some of the other options in the roundup, the T-Fal set does not feature lids for the frying pans, which is a slight disappointment. May be a little heavy compared to some options; that said, a lot of people prefer heavy cookware, so some may see this as a pro. Cuisinart has updated their handle design. The new handles reflect modern tastes while still being timeless enough to suit most kitchen aesthetics. Additionally, the handles are riveted for durability and are cool-grip, so burning your hands on stainless steel cookware is a thing of the past. 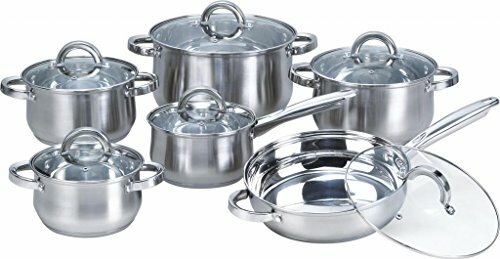 The Cuisinart MCP-12N Multiclad Pro Stainless Steel 12-Piece Cookware Set features stainless steel covers that are uniquely tight-fitted for self-basting and ultimate flavor sealing. Cuisinart also notes that their tight-fitted lids seal in extra nutrition, too. 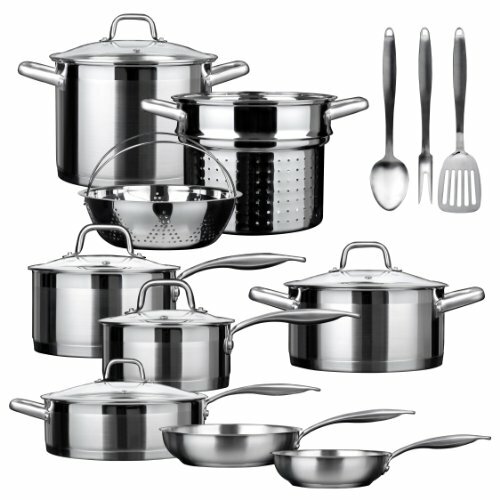 Cuisinart’s stainless steel set is made with triple-ply construction for improved performance and durability. While the outer and interior layers feature ultra-durable stainless steel, the interior core is made out of premium aluminum for better heat distribution, cutting out the chance for inexplicable hotspots that can lead to burned food. In addition to the aluminum core, heat distribution is also enhanced with Cuisinart’s Heat Surround technology, which not only improves heat distribution at the base of the cookware, but on the sides as well, leading to a more even cooking experience. Cuisinart’s Multiclad Pro Stainless Steel set is guaranteed to be safe for induction cooktops, which means you don’t have to worry about compatibility issues if you’re also in the market for an oven upgrade. I may sound like a broken record, but once more, it’d be nice if the frying pans featured covers like the rest of the set. While not necessary on a frying pan, it’s a nice touch, especially when you consider more and more people are cooking one-pan meals as a quick, healthy supper for their families, some of which require covering for best results. Duxtop’s stainless steel set is guaranteed to be safe for the largest variety of stovetops, including induction, infrared, radiant glass, ceramic, gas and electric. Because of this, Duxtop’s set is the most “futureproof” stainless steel cookware set option in that it will be compatible with not only your current stovetop, but any different stovetop you might have in the future. The ergonomic handle features an anti-slip satin finish. All of the handles are directly riveted onto their cookware to ensure lasting durability. The entire Duxtop 17-Piece Stainless Steel Induction Cookware Set is made from 18/10 premium-grade stainless steel, the type of stainless steel commercial chefs would have in their own cookware. 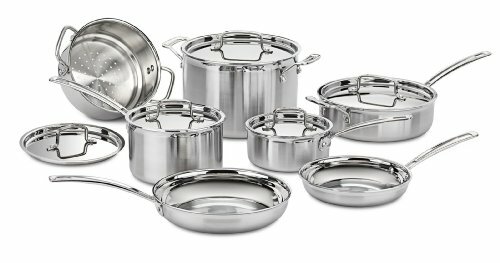 Every piece of cookware in the Duxtop 17-piece stainless steel set features a heavy-gauge impact-bonded aluminum encapsulated bottom. The benefit of this is superior heat distribution as well as durability. Aside of being suitable for all stovetops, the Duxtop set has other versatility features as well. It’s oven safe and can also be used to store food in the freezer. The latter is a quality that is rare in stainless steel cookware, so it’s sort of a standout feature. You have to keep them cleaned and well-maintained to keep them looking brand-new, but this is a problem with all stainless cookware, so it’s not a major issue. There are a lot of great stainless steel cookware sets in this roundup, but the standout and winner is clearly the Duxtop SSIB-17 Professional 17-Piece Stainless Steel Induction Cookware Set. The reason it gets top marks is because it’s so comprehensive, it has virtually every piece of cookware you need to get a kitchen up and running—and then some. Furthermore, Duxtop’s ability to be used on all cooktop surfaces ups their versatility tremendously, as does the fact that not only is the set oven safe, but it’s freezer safe as well. For all this and more, Duxtop deserves the top spot.